Bussang | Main France |. 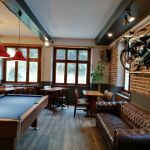 A biker-hotel on the border of Alsace and Vosges, on the Route National 66 ran by Dutch owners Mark and Ida and a very popular place with Bikers from the UK, Belgium, The Netherlands, Switzerland, Germany and France. A choice of 17 rooms, all with their own bathroom and good beds; doubles, twins, triples and a suite with five single beds. Also a room suitable for disabled guests on the ground floor. A continental breakfast buffet with breads, cheese, jam and sliced cold meats to start your day. 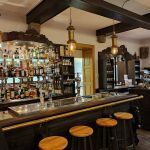 The atmosphere here is warm and informal, with good music played, a comfortable restaurant for dinner and a bar open 16 hours a day until 00.15! There is a huge beer-garden where you can enjoy the sun, sit in the shadow of an old lime-tree and in the evening enjoy specialities of the region - chicken in Riesling-sauce, Choucroute and excellent spareribs. A lot of wine from the region, beer on tap and an espresso-bar. 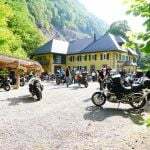 The hotel is situated in the high Vosges Mountains at an altitude of 731 meters and a beautiful area to ride your motorcycle, with many beautiful alpine roads and splendid views. Within easy reach of the World War 1 Memorials and Cemeteries in Alsace and a great place to use as a stop off travelling through France to Switzerland, Italy and beyond. Speaking English, French, German and Dutch. Designated covered motorbike parking. village in the hills above the Mosel Valley. in East France, south of Luxembourg. Places to visit include The Castle of Arry, Maucourt distillery and vineyard in Vezon, frescos from 1540 at the Saint-Martin church of Sillegny, Gallo-Roman aqueduct and the historical city of Metz, with its 14th Century Gothic Cathedral. A great place to use as a stop off travelling through France to Switzerland, Italy and beyond. Biker Friendly Accommodation. Hotels, B&B, guest houses, cottages, hostels, camping. Ideal for touring!